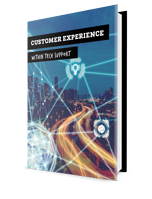 We at Barona IT wanted to discover what are the trends in tech support field now and how do the experts see its development and the meaning of customer experience within tech support. Barona IT is developing technical support in the Nordics by employing more than 700 technical support specialists annually for almost 10 years and we have seen a big change through our customers and now we want to share the best practises for everyone working within tech support - Enjoy! This guide has been co-written with the digital experts of our corporate community, Barona Group. The book is based on our own experience and their expertise. Moreover, we have interviewed five seasoned experts who work with IT support on a daily basis.